Unearthed by Amie Kaufman and Meagan Spooner is definitely one of my most anticipated reads for 2018, and I absolutely couldn't wait to get started on the book. I have read two books from the Starbound series by these authors in the past, as well as Amie's Illuminae series (co-written with Jay Kristoff), and I enjoyed all of these books immensely, so I knew I would enjoy this book as well. And I did! The story is told from alternate viewpoints between Mia, a scavenger who has traveled to an alien planet to look for loot to sale, and Jules, a scholar who wants to study the alien culture before scavengers like Mia destroy it all. Mia is a survivor; she does what she has to do it make it through the day to day, and wants nothing more than to take care of her sister, the only family she has. Jules is the brains, wanting to know more and more about the ancient world that could eventually save the dying Earth. When these two form an unlikely alliance, they are pretty much unstoppable. Overall; If you can't tell by all the gushing I did above, I really enjoyed Unearthed! Especially the last half of it, and after that ending, I will definitely anticipating the release of the second book. Lucky for me I still have the Illuminae and Starbound series to read this year, both series I am starting over so I can read them from start to end, so I'll at least have something to keep me busy while I wait! 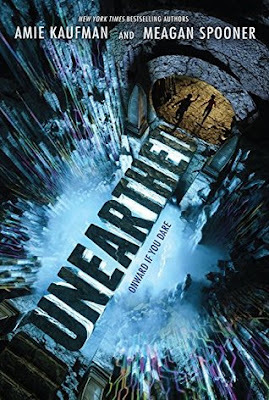 If you're a fan of either of these series, or just a fan of sci-fi in general, do check out Unearthed when you can!